If you're a fan of functionality dressing when it comes to fashion, you'll love this uber cute pairing of a grey denim jacket and a tan leather satchel bag. You could perhaps get a little creative in the footwear department and lift up your outfit with brown leopard suede ballerina shoes. If you're a fan of practicality dressing when it comes to your personal style, you'll love this totally chic pairing of a navy floral bomber jacket and a Chloé small faye day bag. Bring instant interest and excitement to your outfit with white low top sneakers. If you're a fan of relaxed dressing when it comes to your personal style, you'll love this super cute pairing of a beige cutout short sleeve blouse and a Chloé small faye day bag. When it comes to footwear, this ensemble is round off brilliantly with black leather thong sandals. 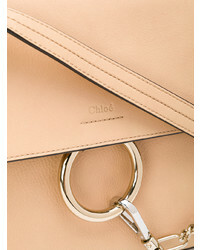 If you're a fan of relaxed dressing when it comes to fashion, you'll love this chic combo of a tobacco leather biker jacket and a Chloé small faye day bag from farfetch.com. Wearing a pair of white low top sneakers is a simple way to add extra flair to your outfit. Pair a camel coat with a Chloé small faye day bag for a lazy day look. When it comes to footwear, this ensemble is finished off wonderfully with white low top sneakers. 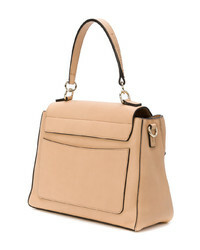 If you're hunting for a casual yet totally stylish look, dress in a dark brown fur coat and a Chloé small faye day bag. Both garments are totally comfy and will look fabulous together. Perk up your ensemble with black leather ankle boots. 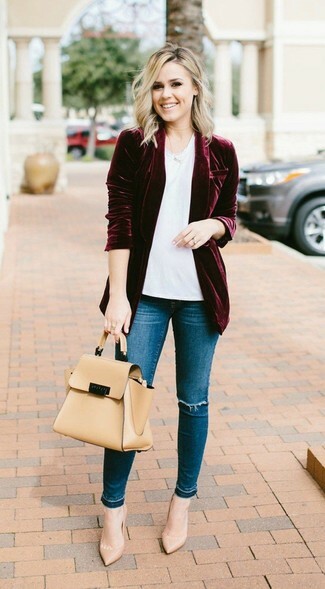 If you're obsessed with comfort dressing when it comes to your personal style, you'll love this extra adorable combo of a burgundy velvet blazer and a Chloé small faye day bag. Amp up the cool of your look by wearing tan leather pumps. If you're a fan of relaxed dressing when it comes to your personal style, you'll love this extra adorable combo of a white fluffy crew-neck sweater and a Chloé small faye day bag. You could perhaps get a little creative in the footwear department and elevate your ensemble with white leather pumps. If you're a fan of relaxed dressing when it comes to your personal style, you'll love this super cute combination of a grey biker jacket and a Chloé small faye day bag. Sporting a pair of grey leather ballerina shoes is a simple way to add some flair to your look.